...the r and n seem too close together, and I momentarily think it's Double-Chum Ice Cream. Is it just me? Nice! I understand that the writers of the movie "Election" named Reese Witherspoon's character Tracy FLICK for the same reason. See also this posting on Language Log, too. Oops. Please disregard either the also or the too on that last comment. 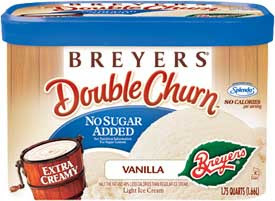 It could be a blatant attempt to play with our perceptions: It makes us think that double churn is our friend (or bait?). It could also be a stealth campaign to undermine the unpasteurized milk movement - another chapter in "as the stomach double churns."